» Konkan Railway Recruitment 2018 For 100 Vacancies! Konkan Railway Recruitment 2018 For 100 Vacancies! 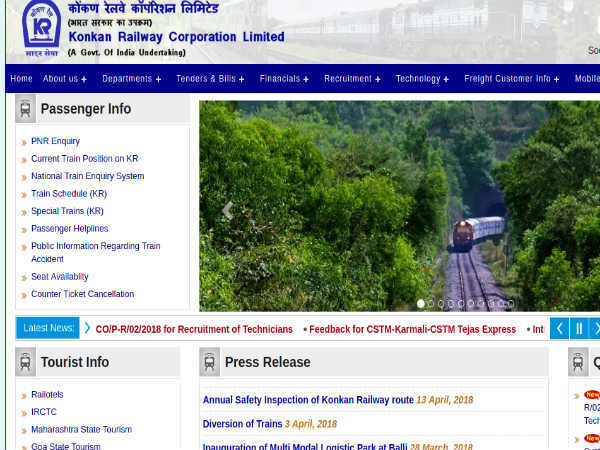 Konkan Railway Corporation Limited has released an employment notification calling out for aspirants to apply for various posts. Those interested can check out the eligibility, salary scale, how to apply and the complete details of the government job here. Selected candidates can earn up to level 1 pay matrix in 7th CPC. The last date to apply for the government job is June 21, 2018. Step 1: Log on to the Konkan Railway Corporation Limited official website. Step 2: Under Recruitment, select Current Notifications. Step 3: The list of recruitments will be displayed on the screen. Click on the Apply link against the notification link Notification No. CO/P-R/5/2018 for Recruitment of Trackman , Assistant Pointsman , Khalasi. Step 4: The application instructions will be displayed on the screen. Read them carefully. Step 5: Scroll down to the bottom of the page and click Register. Step 6: The recommended browsers list will appear on a pop-up screen. Read it and click Close. Step 9: Click Register and complete the registration process.